The Hague Institute for Global Justice has successfully held its first professional training course. 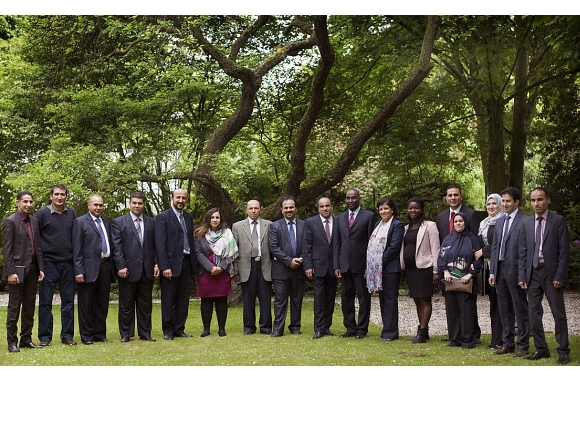 From 11 to 13 June 2013, thirteen Libyan judges and prosecutors received dedicated training under the theme Rule of Law and Transitional Justice in Libya. The goal was to enhance the capabilities of the Libyan justice professionals by providing them with the knowledge, expertise, and experience gleaned from other conflict-affected countries and from the Netherlands. Providing professional skills training is an essential part of the Institute’s practical work to promote peace and justice internationally. The training course is a timely measure in supporting Libya’s transition toward democracy following the breakdown of the Qaddafi regime in 2011. Libya’s newly elected national assembly is now working on a comprehensive effort, the Transitional Justice and National Reconciliation Law, to deal with human rights violations committed by the Qaddafi regime since September 1969 and with crimes committed during and after the 2011 civil war. Overcoming the legacy of human rights violation and promoting reconciliation among tribes divided by Qadhafi’s politics and conflict is central to the long-term stability of the new Libyan state. Over three days, renowned international experts—from academics to judges to prosecutors—delivered a series of lectures in the field of international criminal law, transitional justice and international humanitarian law. Judge Alphons Orie of the International Criminal Tribunal for the Former Yugoslavia (ICTY) in his lecture emphasized the importance of transparency and fairness as key issues in post-conflict criminal prosecution. Acknowledging the importance of public opinion during a transitional period, Judge Orie reiterated that the goal of all criminal justice systems is to find a solid and fair balance between public opinions and the rights of the defense, noting that public opinions cannot be used to overrule international obligations. In her lecture, Human Rights Watch’s legal counsel Balkees Jarrah highlighted the importance of the active engagement of Libyans with the International Criminal Court (ICC) despite the fact that Libya is not a signatory of the Rome Statute. Addressing the challenges in investigating and prosecuting international crimes, Ms. Hester van Bruggen, head of the International Crimes Unit at the Dutch National Prosecution Service, and Mr. Dan Saxon, former senior trial attorney at ICTY, both emphasized the importance for countries in transition to establish a clear policy on the types of crimes they wish to prosecute and to execute this policy in a fair and impartial manner. Other major topics during the lecture series include the rules in relation to international humanitarian law and those regarding compensation and remedy for victims of violations of international and customary humanitarian laws.